ABOVE: The Christmas Market by the Heiliggeistkirche in Heidelberg. 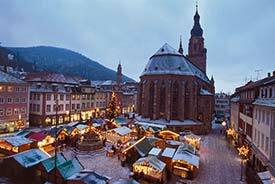 With a romantic castle overlooking the city, a major university, and a prosperous Altstadt to attract shoppers, Heidelberg is a lively place to visit in the weeks leading up to Christmas. Most of the city's Christmas markets are scattered along the Hauptstrasse, or main shopping street, making it easy to drink Glühwein, buy sausages and other treats, or examine the wares in 140 market stalls as you head from one end of the old town to the other. Bismarckplatz is the gateway to Heidelberg's pedestrian zone. As Heidelbergers step off trams and buses in front of the city's major department stores, they're greeted by wooden huts that set a convivial mood in the busy square. You can join them or head into the Altstadt, where the Anatomiegarten has the first of the markets that you'll find in the pedestrian zone. It's a small, cozy market where you ease into the Weihnachtsmarkt scene. Continue along the Hauptstrasse, and you'll encounter the busiest of Heidelberg's Christmas markets at Universitätsplatz. This is a popular spot for food, with items like pork-steak sandwiches and grilled salmon along with the usual sausages and mulled wine. It can be hectic and a little overwhelming if you're jetlagged, but the crowd is in a good mood and there are dozens of booths selling food, gifts, and Christmas decorations. Your next stop on Heidelberg's Christmas pilgrimage circuit is the market at Theaterplatz, which is geared to children but is pleasant for visitors of all ages. The final Christmas market in the Altstadt is at Kornmarkt, a short walk from the Marktplatz beneath the floodlit Heidelberg Castle. Highlights include an ice-skating rink that stays open until early January (you can rent skates in the warming hut) and a two-story chalet bar facing the rink and the Schloss. Above the Altstadt, you'll find a Christmas market in the gardens of Heidelberg Castle, which can be reached on foot or--more conveniently--by funicular. Days and hours are limited, so check the official Heidelberg Palace Christmas page for details. Christmas markets aren't the only Advent attractions in Heidelberg: You can also attend concerts (Cheryl and I enjoyed a choral concert in the Peterskirche). Also, many of the local shops have Christmas foods and displays. The inset photo above shows the window of Café Konditorei Gundel, where you can stock up on holiday cookies, and the picture to the left shows a decorated windowsill in the Kulturbrauerei hotel and beer hall. Top inset photo copyright © Suzanne Miltner.